Add natural beauty to your home or office with air plants! These indoor plants don't need soil to grow, so they can flourish in many different environments. Additionally, they require only a moderate amount of light and only need watering about once a week, making them the lowest-maintenance plants available! They make excellent gifts for house-warming or other occasions. They are also work wonderfully as desktop decorations for your office or home desk. 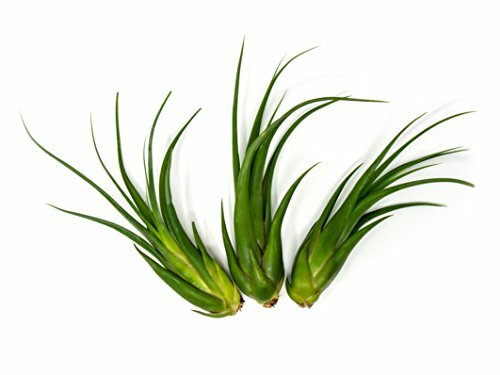 A Circinata air plant features sturdy and long, bright green leaves that grow upwards and curl slightly at the ends. These leaves are wide at the base and gradually narrow to points at the ends. During its blooming periods, the Circinata air plant grows striking yellow and/or purple blooms. We are thrilled to offer this uniquely stunning and sought-after air plant at an impressive size of 7 to 9 inches tall in height and 1 to 2 inches wide. This plant's maturity and larger size means that has even less care requirements than smaller air plants. Large air plants can tolerate less watering and less lighting than their smaller counterparts. We recommend keeping air plants in an area where they receive a moderate amount of light. Indirect sunlight and artificial home/office lighting are appropriate for these plants. It's generally safe to keep air plants in direct sunlight for 2 to 3 hours or less each day, but we recommend misting them with water to keep them from drying out. The optimal way to water these air plants is to soak them in water for 2 hours once per week. If you find the leaves of your air plants are becoming soft or pale in color, this means the plant is too dry, and you should try misting or watering them more often. BEAUTIFUL AIR PLANTS AT THE LARGEST SIZE AVAILABLE: Our Giant Circinata air plants are huge, mature plants that have been growing for several years and are rarely seen for sale. EASY CARE HOUSE PLANTS: Tillandsia Air Plants are extremely low maintenance and easy to care for. They require only a moderate amount of light, no soil, and only need watering about once a week. DIY HOME DECOR: Air plants are perfect for terrariums, cages, and a myriad of other creative displays; the possibilities are limited only by your imagination. ECO-FRIENDLY: Many Tillandsias are becoming endangered in the wild due to over collection. To protect these threatened resources, all of our air plants are greenhouse grown and never wild collected. HEALTHY LIVE ARRIVAL GUARANTEED: Your air plants will arrive alive and healthy. Each order will come with a 100 percent live arrival guarantee. If you have any questions about this product by Plants for Pets, contact us by completing and submitting the form below. If you are looking for a specif part number, please include it with your message.